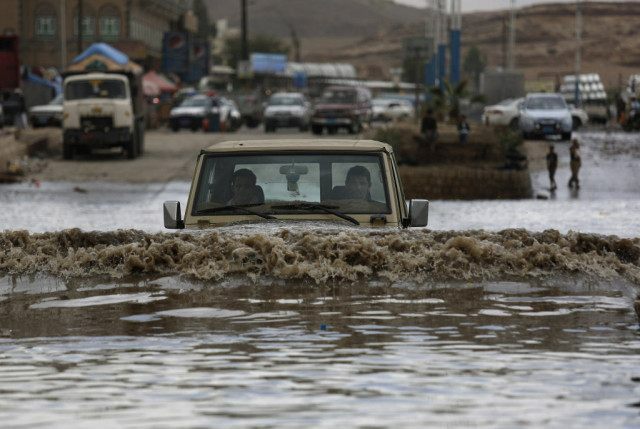 SANAA, Yemen (AP) — Yemeni officials say heavy rainfall in several parts of the country has caused widespread flooding and the collapse of small dams, including one in Hajja province northeast of the capital, Sanaa. The officials said at least one person was killed Thursday in the flooding. Damage to property was particularly heavy, with rushing muddy water cutting off roads and sweeping away cars and cattle. Besides Hajja, unusually heavy rainfall over the past 24 hours hit Sanaa, the southern port of Aden and Omran province north of the capital. Yemen is located at the southern corner of the Arabia Peninsula, overlooking the Red and Arabia Seas. Its rainy season falls in the spring.